Keep the inside cool all day for the next to nothing in energy costs. Preventing daytime heat build-up also cuts evening cooling cost. keep the work area comfortable during business hours for pennies per day. Cool or heat up to 750 Sq. Ft (69m). Compatible with 50Hz and 60Hz power, use it anywhere in the world. This unit install exactly like a normal mini-split solar air conditioner. 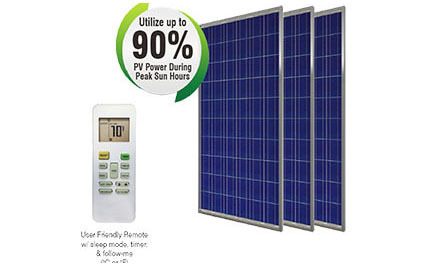 Standard MC4 solar connectors and cabling can be used to connect the solar panels directly to the A/C unit. 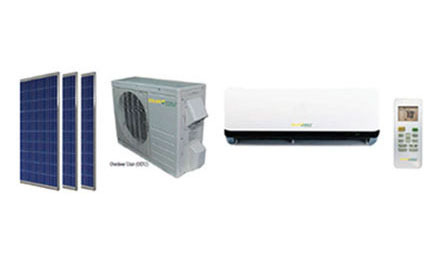 In general, a solar hybrid air con can cost between $1800 – $2000 excluding installation fees. It might sounds expensive at the start but think about the life time cost savings on your utility bills and how your actions can save the environment long term.